Assaji (Pali:Assaji, Sanskrit:Asvajit) was one of the first five arahants of Gautama Buddha. He is known for his conversion of Sariputta and Mahamoggallana, the Buddha's two chief male disciples, counterparts to the nuns Khema and Uppalavanna, the chief female disciples. He lived in what is now Uttar Pradesh and Bihar in northern India, during the 6th century BCE. Assaji was born into a brahmin family. His father was one of the eight brahmin scholars who were invited by Suddhodana, the monarch of the Sakyan kingdom to Kapilavastu to read the fortune of his son Siddhartha. Assaji's father and six of the other brahmins had predicted that Siddhartha would either become a great religious leader or a great military monarch. Kaundinya, the youngest was the only one to confidently state that Siddhartha would become a Buddha. As a result, when Siddhartha renounced the world, Kaundinya and Assaji, as well as Bhaddiya, Vappa and Mahanama, three sons of three of the brahmin scholars joined Siddhartha in the ascetic life. The five joined Siddhartha in self-mortification practices at Uruvela. When Siddhartha abandoned this practice to follow the Middle Way, they left him in disappointment, believing he had become indulgent. But after the Enlightenment, the Buddha visited them at Sarnath, where they had journeyed after the split. 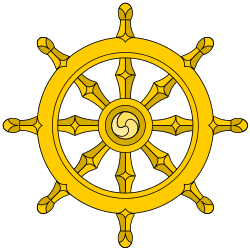 The Buddha preached the Four Noble Truths and the Dhammacakkappavattana Sutra, and they became the first five bhikkhus of the sangha. 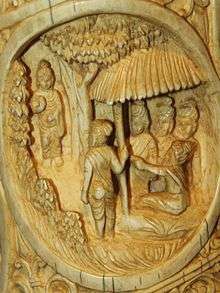 Assaji was the last to understand the teachings, and the Buddha had to give further explanations to him and Mahanama while the other three bhikkhus went out on alms round. He was the last to reach sotapanna, the first stage of arahanthood. He became an arahant, together with the others, at the preaching of the Anattalakkhana Sutra. This is the teaching of the Great Recluse. Sariputta comprehended, gaining sotapanna, the first stage of arahanthood after hearing the teachings, which implied the Four Noble Truths. He went off to tell Mahamoggallana, his friend since childhood that he had been successful in his search for enlightenment. Both then became bhikkhus in the sangha and went on to become the two chief disciples of the Buddha. Assaji was highly venerated by Sariputta, and in whichever quarter Assaji was residing, Sariputta would extend his clasped hands in an attitude of reverent supplication in the direction, as well as turning his head when he lay down to sleep in the direction. One day when Assaji was going through Vesali for alms, the Nigantha Saccaka, who was looking for ascetics to debate, questioned him regarding the Buddha's Dharma because Assaji was a prominent disciple (ñātaññatara-sāvaka). Assaji delivered a summary of the doctrine contained in the Anattalakkhana Sutta. Confident of his ability to refute these views, Saccaka went with a large concourse of Licchavis to the Buddha and questioned him. This was the occasion for the preaching of the Cula-Saccaka Sutta. 1 2 3 4 "Assaji". Buddhist Dictionary of Pali Proper Names. Archived from the original on 13 March 2007. Retrieved 2007-04-03. ↑ "Pancavaggiya". Buddhist Dictionary of Pali Proper Names. Archived from the original on 29 April 2007. Retrieved 2007-04-03. ↑ "Anna Kondanna". Buddhist Dictionary of Pali Proper Names. Retrieved 2007-04-03. ↑ "The Life of Sariputta". Buddhist Publication Society. 2006-09-23. Archived from the original on 4 April 2007. Retrieved 2007-03-30.